Intel 1.66GHz N280 Atom processor coupled with 1GB of RAM. It also offers what ASUS are naming the longest-lasting battery life for one of their netbooks to-date with up to 10.5hrs. 160GB hard-drive, WiFi b/g/n and Bluetooth 2.1+EDR, along with a 1.3-megapixel webcam, digital array microphone and 10.1-inch 1024 x 600 LED-backlit display. Ports include a mini-VGA connector, two USB 2.0, ethernet, audio in/out and a memory card reader. 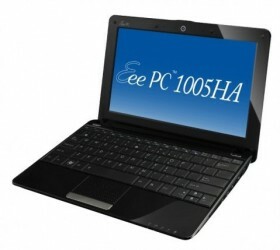 The ASUS Eee PC 1005HA Seashell retails for $389.99, available to preorder in black or blue. Asus has been a leader in the netbook business and they are still prooving it by releasing new types of Eee PC Netbook. I can say that EeePC is reliable since I am using Eee PC 904HA , which I had made a full review of the unit. Hi, where is the area if it is pre-order? and how much for peso? .-= WhatsACoder´s last blog ..Kamen Rider Black plus a surprise =-. I think there are netbooks that have DVD Drive..